Exploring math is not only one of the most fun things you can do with your preschooler – it is one of the most important. Greg Duncan, an economist and University of California Irvine education professor, found in a 2007 study that early math skills is one of the best predictors of later success in both math and literacy. (Duncan, Greg, et al. School Readiness and Later Achievement. American Psychological Association, 2007. Vol. 4. No. 6. 1428-1446.) That’s right – early math skills were a better indicator of later academic success than anything else. More than social skills, more than behavioral skills, and even more than early reading skills! In the preschool years, you are introducing the very basics. And you don’t need a curriculum to do it! Incorporating math concepts into play and everyday activities is our favorite way to nail the subject. Here are some ideas to get you started. And this is NOT a must-do list by any means! Your preschooler will be just fine if you don’t cover them all. This is an ideas list – something to spark educational play and exploration. Count everything. Count cars, Cheerios, stuffed animals – anything and everything. The goal is to memorize the order of numbers and to discover their repeating patterns. You don’t have to get to 100, but see how far you can go! Counting on number lines is also critically important because it provides a sense of a number’s proportional distance from its neighbors. More plainly, it lets children see that 8 is closer to 10 than to 1. Board games, such as Chutes and Ladders, make great number lines. And books are number lines too! I love reading to my 3-year-old and then taking turns picking page numbers to flip to. As she learns that you flip forward from page 4 to get to page 7 and backward to get to 2, she is actually learning crucial number sense skills. If counting by 1’s is going well, you can begin to incorporate skip counting. 10’s and 5’s are the easiest to start with. We have so much fun setting the numbers to song or chanting them, and incorporating body movements like clapping, jumping, and stomping. Recite them while you skip rope or toss a ball to each other. It’s a great way to get wiggles out while you learn! We shoot for recognizing and/or writing numbers 1 through 20 by Kindergarten. My girls loved worksheets at the preschool age, which made practicing number recognition and writing easy. But there are many other ways to work it in if your little one isn’t ready to sit and work with pencil and paper. Try . . . Numbers are everywhere, even in nature! Pointing them out wherever you go is often all that you need to do. Ask your child to trace them with her finger. And sensory activities like writing numbers in sand or shaving cream inside a sealed plastic bag add kinesthetic learning value. One-to-one correspondence is just a fancy term for the concept that the number 1 means one thing, 2 means two things, etc. It requires that a child grasp that numbers are not just words that are recited in a certain order, but that they stand for amounts of things. This is why I recommend counting lots of different kinds of objects right from the beginning. Because if you only count cars, for instance, a child may start to associate the number words with cars, rather than amounts of items. Any objects you use for counting can also be used to introduce addition and subtraction. Rather then worksheet-type math facts, just talk it out like a word problem. “If we’re having a tea party with two stuffed animals and three more come to join, how many guests are there now?” Help her count the answer. It gets her thinking about numbers in a concrete sense, their relationships to one another, and how they operate in our world. The way I explain the difference between 2D and 3D shapes to my little ones is that two-dimensional shapes are flat, like a circle made of paper, but three-dimensional shapes are ones we can hold and look at from many sides, like the sphere of a ball. Not exactly a perfect definition – but my little children have always gotten the distinction. Pattern blocks are my favorite resource for patterns. *Go figure. * But you can use lots of simple household objects. Try different colored paper clips or toy cars. Just start by making a simple pattern and inviting your child to help you continue it by asking her what comes next. You can gradually increase the complexity of the pattern as she gets better at the game. This gets her mind in the habit of looking for and recognizing patterns in preparation for doing the same thing with numbers later on. Bonus: play the pattern game by stringing different colored pony beads on pipe cleaners and *boom*, you’ve added fine motor skills practice as well! Cooking is a perfect way to introduce why and how we measure things. But there are many more! Show her how grown-ups use measurement in all sorts of ways – baking, sewing, building things. The list goes on. Measure your child’s height against the wall or the circumference of a bouncy ball, measure the air in her bike tires or the weight of her piggy bank. We weigh our guinea pigs in our kitchen scale and chart their growth. (Charts – Added math bonus!) Your home is full of ways to measure, and the purpose is just to get her familiar with the process. Learning about making comparisons is about vocabulary more than anything else. There are several words that are crucial to grasping math lessons in later grades. The more familiar she is with some of these, the better. And the best way to ensure that is to use them often and in context. When your little one complains that she has less snack than their sibling, rejoice! That is a math win! When it comes to teaching a preschooler about money, I try – through everyday experiences – to instill the principal that money has value and that we can exchange it for things we need and want. This is a wonderful age to begin the habit of saving a portion of any money your child receives and showing her how it accumulates over time. Learning the names of the coins and how many cents they’re each worth is helpful too. Coins make a great counting aid and are useful for working on one-to-one correspondence, comparing amounts, and even skip counting (count nickles by 5’s and dimes by 10’s). 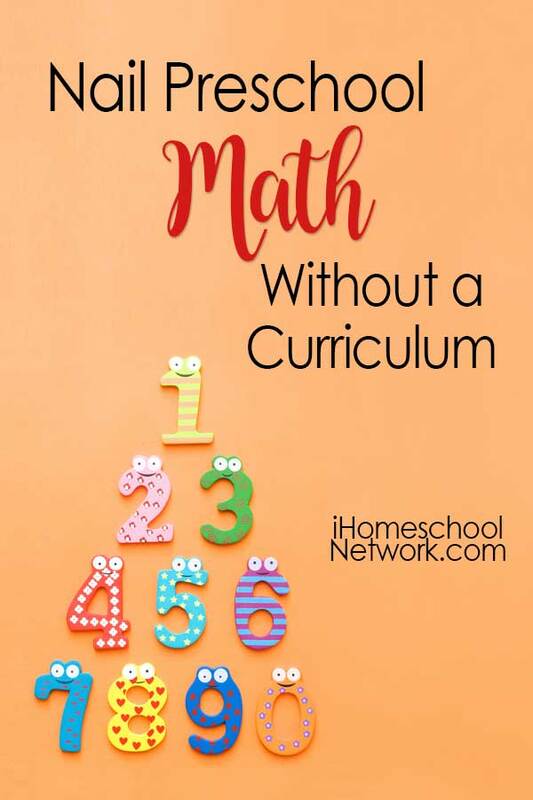 In our homeschool, preschool math is not all about memorizing math facts or filling a binder with worksheets. (Although there’s some of that.) It’s about getting familiar with concepts and vocabulary. It’s about seeing math in the world and how math helps the world work. You are digging out the foundation in math literacy and number sense upon which you will build for years to come. To find out more about how we homeschool preschool – including printable learning objectives (ideas) for every subject – check out our Pre-Kindergarten curriculum. My passion is to help and encourage other moms of little ones in their homeschooling journey. It’s a long road ahead – but you don’t have to walk it alone. Vida is a second generation homeschooler whose passion is to help and encourage moms of little ones in their homeschooling journey. A writer, speaker, and consultant - her website is Mercer Homeschooling, which provides resources and encouragement for homeschooling the early years.